Tony Hastings guides you through the operation of this comprehensive but easy to use step/real-time recording package that's quickly gaining popularity with musicians. As the title of this piece implies I am going to delve into the workings of the Pro 16 sequencer, so without further ado let's get down to business. 1. A Commodore 64 computer with a disk drive and monitor. 2. The necessary MIDI interface to plug into your computer (which includes sync in/outs for external triggering). 3. The floppy disk containing the software to drive the system (and a blank floppy to store your songs on). 4. At least one MIDI keyboard (or you ain't going to make much sound!). Now you know what you need, let's see how it all works. I hooked my Commodore up to three keyboards and a drum machine: a Roland JX8P, a Yamaha TX7, a Casio CZ101 and a Roland TR707 - enough I thought to make a dent into the 16 different tracks available and to see what sort of stuff the Steinberg is capable of. The first thing you see after the software has loaded is a screen full of boxes, words and numbers. Time to consult with the oracle and get to grips with the manual. Actually, the manual looks very sparse, only 13 pages of information; is that enough or is the system so good that you don't need much? Time will tell. First off the manual tells you where to plug in the MIDI interface cartridges; well, I worked that out for myself. What next? Aha (do they use one? ), a diagrammatic picture of the screen divided into four different areas: Track Table, Text Line, Function Table and Song Table. So let's deal with each section one by one. This consists of two rows of double boxes numbered from 1 to 16. Each double box has the word 'ON' at the top, a number in the middle and one at the bottom. The word at the top can be switched between 'ON' and 'OFF' by using the Commodore's F1 or F3 key respectively; this turns the track on or off (it doesn't actually 'wipe' a track, it just mutes it). The number in the middle designates the track number and can't be altered. The number at the bottom corresponds to the MIDI channel you wish that particular track to use to control the synth voices and is switchable to any of the 16 MIDI channels again using the F1 and F3 keys; in fact, nearly all the functions are incremented or decremented in this manner. To move from track to track, or from 'ON' to 'OFF', or to access the function table you can move the cursor using a combination of 'Shift' plus the cursor keys (by the way, if you were wondering where the cursor is when you switch on, it's in the top left-hand corner blinking merrily away to itself). Text messages are displayed in the central red box on screen indicating whichever function is currently being performed. This simplifies the use of the Steinberg software and is a great aid - particularly for the musician unfamiliar with computers; you always know where to look to find out what's going on. The function table looks similar to the track table at first glance, but here each box has a different function, and I'll describe them in order. TMP. In this box, you choose the tempo of your sequence and each different sequence pattern must be entered individually; this enables you to have a song with changing tempos throughout if you so desire. BAR. This box denotes how many bars will be in a particular sequence (1-64 bars can be set in each sequence). TMSIGNT. These boxes together are used for different time signatures ie. 4 in the first box and 4 in the second is the same as 4/4 time; 6 in the first and 8 in the second gives 6/8 etc. QNT. The quantise box. This for me (and probably most other musicians) is a vital function. Depending on what number is set in the box, the notes you enter from your MIDI keyboard in real-time will be moved to the nearest beat so cleaning up any messy playing. This function can be stepped between 4/6/8/12/16/24/32/64/96/0. Obviously the higher the number the more accurately you need to play (choosing '0' gives no quantise at all). There is also one other quantise function which is part of the extended operations mode. If you move the cursor to the track you have played and press O this will 'hyper quantise' the track, which means that any notes clipped during the quantise operation will be given their full value because the spaces in-between will not be re-quantised. REC. In its default form the record function reads 'OFF' (which means it's in play mode) but can be set to record on any of the software's 16 tracks. Annoyingly, you can only record on one track at a time which prevents two keyboard players 'jamming' together and recording the outcome. SGL. Selects between step/real-time recording ('OFF' is the default for realtime recording). I shall talk about steptime recording later in the review. MDE. Switches between Song Mode and Sequence Mode. MEM. This is a display of the amount of memory that you have left and is not user-adjustable. BAR. This tells you which bar the sequence is currently playing at any particular moment. NUM. Identifies the particular beat you are on in the current bar - useful when trying to perform an overdub drop-in/out. VEL. After each track is recorded the relevant velocities are subsequently displayed along the bottom of the screen in the form of vertical bars, although these don't correspond to a set scale so they're only of use as a guide to the balance of track levels. SYN. Three synchronisation options are possible on the Pro 16 sequencer: 'Int' - the sequencer will operate from its own internal clock; 'Mid' - the sequencer is synchronised to an external midi clock; 'Ext' - the Pro-16 reads pulse inputs from tape or a non-MIDI source (48 or 96 pulses per quarter note only). DSK. This calls up the different disk functions for saving, loading, and cataloguing of disks etc. TRP. This permits an up/down pitch transposition to be programmed for each sequence without affecting the timing - unlike speeding up a tape recorder. The divisions are in semitones and (rather oddly) you have to step through instead of merely typing in what's required. To transpose a track you first choose how much you want to transpose by, then move the cursor to the relevant track and press number 4 to implement it. I/C. This enables any sequence to be inserted or copied onto different tracks very easily - vital for urgent re-arranging of songs. Well, that covers all the boxes in the function table, and I think you can see that so far everything seems well catered for and generally well thought out. On the right side of the screen you can see a long list of numbers; this is the display of song sequences (64 different sequences are available). A white bar, left of which are two figures (eg. 17) indicates the song position. As to how the song table functions, well, wait and see as I try and create a song from scratch. I shall describe how I put a song together using all the equipment I listed at the beginning and hopefully this will help explain all the main features as I go along. To begin, I decided that to keep things simple I would assign the Roland JX8P to MIDI channel 1, the TX7 to MIDI channel 2, the TR707 drum machine to channel 5 (why not?) and the Casio CZ101 (operating in its MIDI Mono Mode) to tracks 13, 14, 15 and 16. I ought to make a quick mention of Mono Mode. In this mode, a particular keyboard's facility to play separate monophonic lines utilising different voices at the same time is used by the sequencer (in this case the CZ101 can play four different voices). Using Mono Mode, the channel-to-voice assignment is in ascending order ie. if voice one is set to 13,then voice two will automatically be sent on 14, voice three on 15, and voice four on 16. Having decided which instrument was to run on which MIDI channel 1 then moved the cursor to the bottom of the track 2 box and, using the F1 key, set it to '2'. This means that track 2 will send information on MIDI channel 2 (ie. to the TX7). Then I moved the cursor to track8 and changed the MIDI number to 5, and did the same for tracks 9,10, 11 and 12 (for the drums), finally setting track 13 to MIDI channel 13, 14 to 14, 15 to 15 and 16 to 16 (the MIDI mono channels of the CZ101). The first thing I wanted to record was a piano track using the TX7, so I moved the cursor to the 'REC' box in the function table and using F1 incremented the box number till it read '2' (the track number). I checked the tempo: 120 bpm - perfect! So now I was ready to record four bars of 4/4 music at 120 bpm on track 2 using the TX7. Now came something that I hadn't thought of: the TX7, being an expander, doesn't have a keyboard and the JX8P I already had plugged into the MIDI In of the Pro 16 interface and set to MIDI channel 1. So how do I play the TX7? Simple: when 'REC' is set to a track number, the MIDI Out of the Pro 16 acts as a MIDI Thru using the MIDI channel that the track is set to. Which means that although the JX8P is set to channel 1 and the Thru isn't used, you can still hear what the TX7 is playing. Anyway, let's record. By pressing 'Return' I got a pink screen and a two bar count-in, on the last bar of which the screen turned white and then red whilst recording took place - what a good idea. I played a simple riff from the keyboard which was played back to me immediately the recording stopped and would have carried on if I hadn't pressed 'Run/Stop'. Now alternating between 'Return' and 'Run/Stop' I could play and stop the sequence, checking to see if I had recorded it correctly (I did it a few more times before I was completely happy with my riff). Drums next, so I incremented the 'REC' box till it read 9 (track number) and, as track 9 was sending to the drum machine on MIDI channel 5, playing the low G# key on the JX8P's keyboard gave me a hi-hat. I hit 'Return', counted two bars and then played four bars of hi-hat. Then I moved the 'REC' box till it read 10 (still sending on 5 to the TR707) and now the low C and D keys let me play the bass drum and snare respectively as I overdubbed a rhythm. Finally, I set 'REC' to '13' to send to the CZ101 in its mono mode and recorded a nifty bass line. During all the recordings I could always hear the other tracks playing in sync (if I didn't want to hear a particular track, I just moved the cursor to the relevant track box and 'muted' it). I then used the Commodore computer's F5 function key to increment the song table one step so that the figures on screen next to the song table in the white band now read 01, meaning that I was ready to record the next sequence at step 2 in the song (although to record sequence 2 you must also press 'Shift' + F5 to advance the sequence number to 2). When you compose a new sequence you must reset all the parameters; this is so that every sequence has the capability of being totally different from the last in every respect. I eventually recorded four different sequences: a count-in, a verse, a chorus and a middle eight. To construct a song from these separate sequences you use a combination of F5 (to step through the song table) and 'Shift' + F5 (to increase the sequence number to the one desired); to step back you use F7 and 'Shift' + F7 respectively. Yes, it is that simple and aftersome two hours I had created a masterpiece (well, I thought so!). The beauty of the Steinberg Pro 16 package is that it offers both real-time and step-time recording together - not many sequencers do. So let's review the single step note entry method. First, set the 'SGL' screen box to 'ON', then select a track and press 'Return'. The screen will change colour, but there will be no count-in. To input single notes or chords, select the fastest time value that you are going to use, and set it in the quantise box (eg. 8 will give you eight beats to the bar). Now press the keyboard and one eighth note will be input; if you want a space, press the space bar and you will get a one eighth note rest. To tie a note, depress a note and tap the space bar for each eighth that you want it to last. And it's as easy as that. But the Steinberg story doesn't end there! Who said MIDI delay? OK, you want it, you got it! You can delay any of your tracks by up to 2.5 seconds by simply copying that track to a spare track and turning to Page 2 (yes, I said Page 2) which is accessed by pressing the left arrow key at the top left of the Commodore keyboard. On Page 2 you have three sections. At the top there's a track table with all the tracks reading 'OFF'. To programme a delay, you move the cursor to the track you have just copied to and using F1 and F3 keys you can set up to 255 (the maximum setting) chunks of delay. Don't fear, the manual tells you what each chunk is equivalent to in time settings. And of course you can have as many multi-delays as you have spare tracks. This comes as part of the software and does more than the Akai rack-mounting MIDI Delay, and the Akai unit costs £99!! In the centre of the second page is a Filter function for filtering out such things as pitch-bend (wasteful of memory) velocity and after-touch data sent by your MIDI keyboards. Finally, at the bottom of the Page 2 screen are different boxes for changing the clock in/out pulses, MIDI clock rate etc. 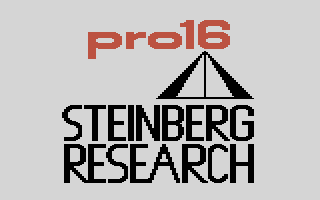 That covers most things the Steinberg Pro 16 offers, so what about the cost? Well, the Pro 16 software on floppy disk is £90 (also on EPROM), the MIDI/sync interface £135. The total Steinberg package, including the cost of the computer and disk drive, is around £500 which means there is nothing that even comes close to this for facilities and sheer, well thought out, professionalism (it's almost worth the software price of £90 alone for the delay facility). Real-and step-time polyphonic recording gives the best of both worlds and access to all the main parameters from one screen means no nested and time-consuming menus to cause confusion. There are many different software sequencers on the market for the CBM 64 and they all have something to offer, but none of them are as complete and easy to use as this one. Well done Steinberg: 10 out of 10! Other Steinberg Research software includes - TNS Scorewriter (£120); Yamaha DX/TX Voice Editor; Casio CZ101/1000 Editor; Korg DW6000 Editor (all £70) plus an excellent Ensoniq Mirage Sample Editor.